You can also find the above chart and others on the Seventh State Results Tracker. The table above shows the party that won the five courthouse offices of State’s Attorney, Clerk of the Circuit Court, Register of Wills, Judge of the Orphans’ Court, and Sheriff. Montgomery and Harford allocate the Orphans’ Court responsibilities to other officials. Nine counties have all Republican teams: Allegany, Caroline, Carroll, Cecil, Garrett, Harford, Queen Anne’s, St. Mary’s, and Worcester. In Frederick, all but one judge of the Orphans’ Court are Republicans. In Somerset, the Sheriff is the only Democrat. Six jurisdictions have all Democratic teams: Baltimore City, Baltimore County, Charles, Howard, Montgomery, and Prince George’s. 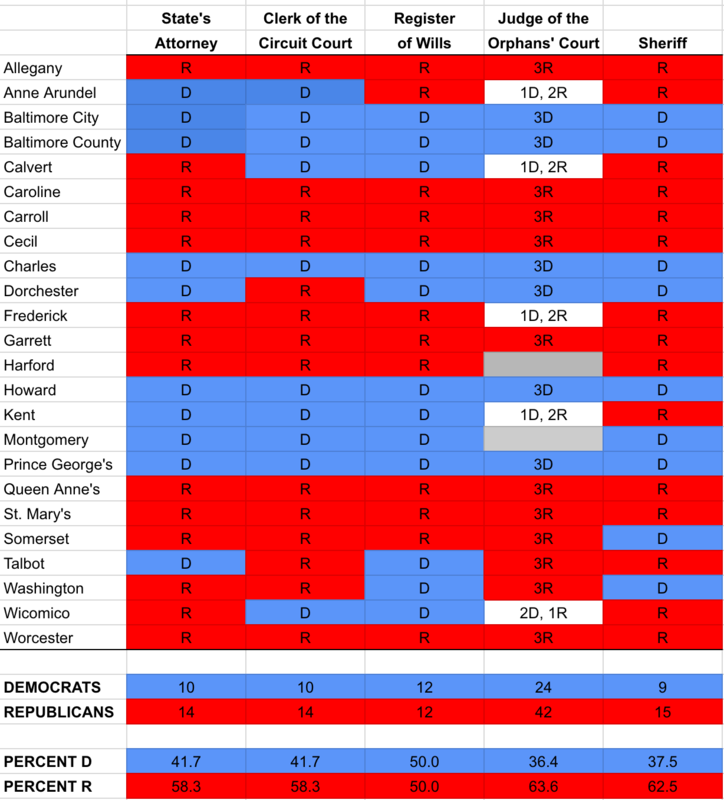 In Dorchester, all but the Clerk of the Circuit Court are Democrats. There are at least two officials from each party in six counties: Anne Arundel, Calvert, Kent, Talbot, Washington, and Wicomico. Calvert, Talbot and Washington are a bit of a surprise to me, as they lean heavily Republican in other county and state elections. Previous PostAutopsy Part III: Was Jealous Just Too Left Wing?Next PostElrich Sends Pro-Business Signals – Anyone Listening?